All-hay and alfalfa November hay price averages were both lower in USDA’s most recent Agricultural Prices report released last week. The all-hay price was $128 per ton, down $3 per ton from the previous month and $10 lower than November 2015. Hay other than alfalfa posted a $2 per ton gain from $121 to $123 per ton, just $1 per ton below November 2015. The month-to-month alfalfa price dropped by $5 to $130 per ton, which is $17 per ton less than one year ago and sets a new year-to-date low. Prior to February, the last time that the monthly average price was at $130 or below was February 2011 when the average was $129 per ton. For alfalfa, Michigan and Nevada were the largest price gainers at $10 per ton. 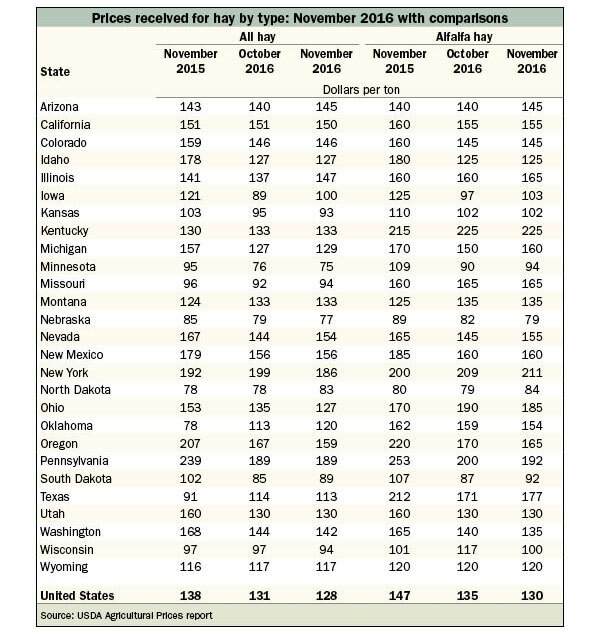 Wisconsin posted the largest decline in average price at minus $17 per ton. The highest alfalfa hay prices are being reported from Kentucky ($225 per ton), New York ($211 per ton), and Pennsylvania ($192 per ton). The lowest prices can be found in Nebraska ($79 per ton), North Dakota ($84 per ton), and South Dakota ($92 per ton). 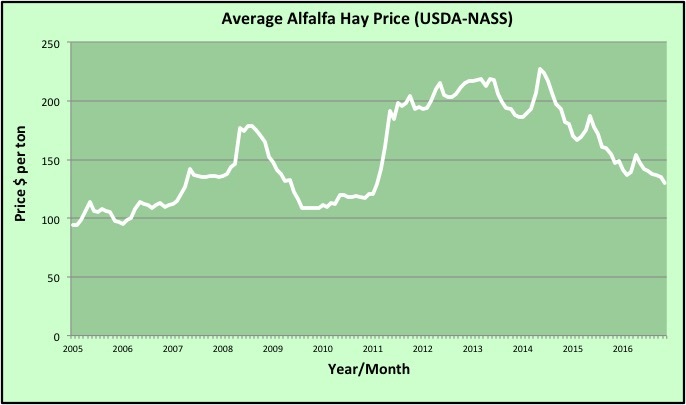 For 2016, the U.S. alfalfa average hay price started the year at $141 per ton, reached a peak of $154 per ton in May, then declined to the current low.